Ahoy there me hearties! It’s me again, yer favorite app pirate ready to give ye another game review. Ye know lads and lasses by now that this old salt is a huge fan of match 3 games. Aye, me have played a lot of this type of game before and they kept me up all night ‘acause me couldn’t put down me phone as me wanted to play more. I bet ye buckos can relate to me. Har, har, har! I will share another review with a match 3 game called Crazy Kitchen by Zynga. Batten down the hatches and let’s begin with the review. 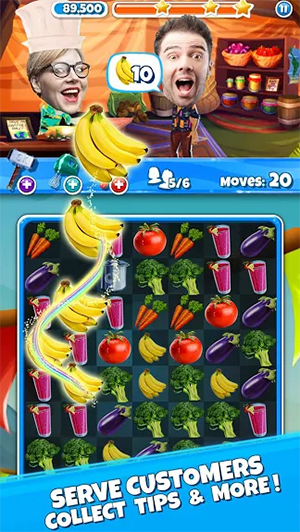 Crazy Kitchen is from the popular game developer Zynga, which is known for its top-notch graphics. They didn’t fall short on the graphics department once again as this app is totally an eye candy. The game map that shows the levels of the game has a gorgeous background. The background varies on the world you are in, which adds excitement as you will see different environment. 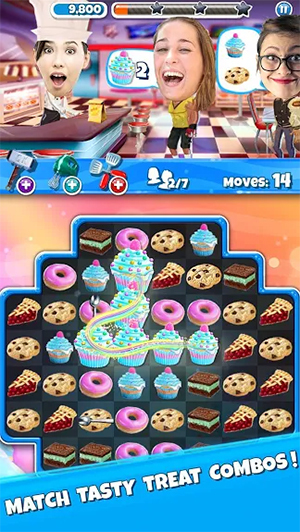 For instance, the first world has a bakery theme so you will see shops with huge signs of cupcakes, cookies, and other bakery treats. The objects on the main game window that you match are also adorable. They have vibrant colors and they are way too cute! Like the background, they also vary depending on the world you are in. This app has the same gameplay as other match 3 games. Connect at least 3 of the same objects to remove them from the game window and earn points. You only have limited moves and there are certain numbers of object that you need to reach per level to move to the next level and earn 3 stars. What makes this one different is that it lets you change the face of the character to your own face. There are also other characters in the game and you can change them to that of your friends’ or family’s faces. This makes the game even more fun and hilarious. The higher levels can be challenging, which may be something that some players want, especially those who are a pro in match 3 games. However, average players may find it difficult to pass these levels, which means using all their lives. Getting a new life may take time, unless you decide to make an in-app purchase. It’s also difficult to earn coins that are used for upgrades, which in turn can help in completing the difficult levels. Crazy Kitchen is free to play. It’s easy to learn and it has adorable graphics. It comes with a fresh twist, which is the option to add customized photos to change the faces of the characters. There are also different worlds to unlock. Some of the higher levels are difficult to solve without the use of power-ups or special objects. However, they require the use of coins, which are difficult to earn. Replenishing lives also take time. If you are into match 3 games, Crazy Kitchen is a must try. It may be difficult to earn coins and it takes time to replenish lives, but this is how most games of the same genre are. So considering that it’s fun, it has different worlds, it has a fresh twist, and it’s free to download, it’s still a nice title to play.